He demonstrates his need for adulation every time he needs to stand up for conservatives. Instead, McCain caves, choosing instead to cater to the Left. McCain loves reaching across the aisle to shake hands with the Devilcrats. When he should be reaching across to squeeze the life out of their windpipes, he’s glad-handing. He’s done this for decades, all in an effort to be liked by the Left. And they roll the old relic out periodically, when they need a “Republican” example of somebody who bucks conservatives. Then the Left celebrates McCain and his political mistress, Lindsay Graham. But the Left really don’t like McCain. They hold him in contempt, and you’d think by now he’d get it. But he doesn’t. Maybe now he will. 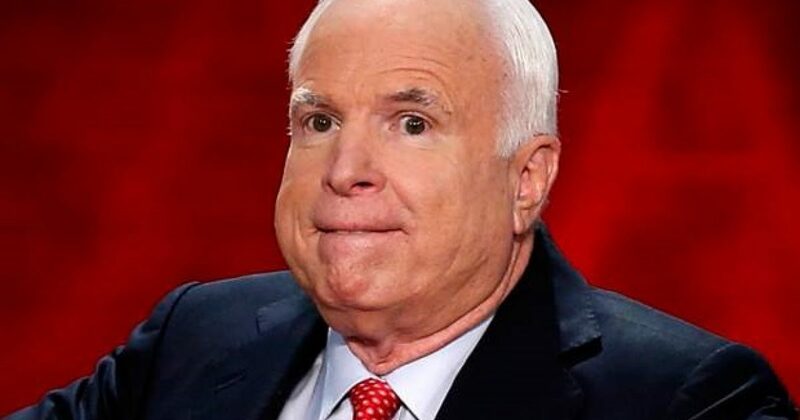 Because upon finding out that McCain has brain cancer, the Left showed little mercy. What about this jewel of a tweet. Instead of Congress losing Obamacare, I suggest they should be forced to KEEP it! We pay for Senator John McCain's healthcare—He just voted to take ours away—Congress should be first to lose healthcare before any American. Is David Corn talking about Bill Clinton? I wonder if David Corn has Obamacare? Will cancer-stricken @SenJohnMcCain help a draft-dodger who called him a loser take health care from millions? Then this will be his legacy. Then there is Jamelle Bouie who misses the irony of her tweet. Obamacare stripped millions of people from their healthcare plans. And it stripped them of their doctors. And then Obamacare stripped millions of Americans of their money in the form of double or triple premiums, and outrageous co-pays. Again, I’d love to ask Jamelle if she has Obamacare and what is her actual reality. You can bet that even if she paid much higher premiums and co-pays she wouldn’t say a word. But know that ordinary people will. Maverick John McCain pulls the Maverick Move of voting to strip health care from millions of people. What a maverick. What slam of repeal of Obamacare would be complete with Keith the Geek Olbermann? I’m fine with whatever doubts Olbermann may have had. But his next statement is more interesting. Good luck explaining what, Olbermann?! Finally, Marisa Kabas sums it up. A very wealthy man opted for the best medicine money can buy. Then he flew to DC to fight for those who wish for the same. I don’t want “all-American” insurance. I want RICH MO FO insurance!